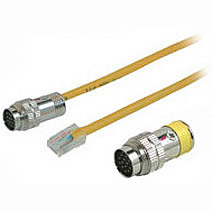 Enables a quick continuity check of the Runner cable prior to sealing it within a wall. Even the most experienced installers, however, will run into hazards that damage a cable or have a cable kink during installation. Problems associated with damage during installation however are seldom found until the trim-out or final installation. The RapidRun Runner cable test adapters have been designed to allow an installer to make a quick go-no go test of the Runner cable prior to leaving the job site. 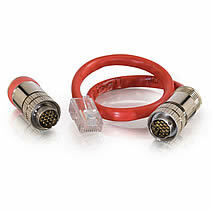 These test adapters include two pieces; a shorting plug that connects to the far end of the Runner cable and an RJ45 cable that connects to the input of a common network cable tester. Problems associated with damage during installation however are seldom found until the trim-out or final installation. 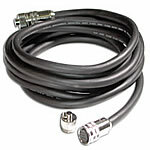 This test adapter includes two pieces: a modified RapidRun connector that connects to the display end of the runner, and an RJ45 adapter cable that connects to the input of a common network cable tester (#26846). • Attach the modified RapidRun connector to the display end of the Digital runner cable. 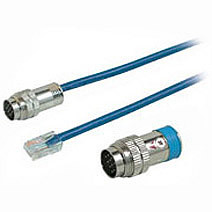 • Connect the network tester to the source end of the runner cable using the RJ45 adapter cable. • Run a continuity test on the cable. • Pins 4 and 5 should show as a short on the test readout. Maps wiring configurations for network cables, even those installed in walls! For installations up to 656 feet. With its small form factor (2in x 3in x 1in), the LANtest-E features a compact design, is practical, easy-to-use and provides clear results. It maps actual wiring configurations for 10/100 BASE-T cables, BNC cables, RJ45/RJ11 modular cables, 258A, EIA/TIA 568A/568B and token ring cables. 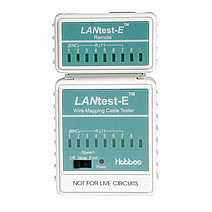 With the included remote unit, an individual can easily test cables installed in walls or patch panels.